What is the SYD Function (Sum of Years Digits)? 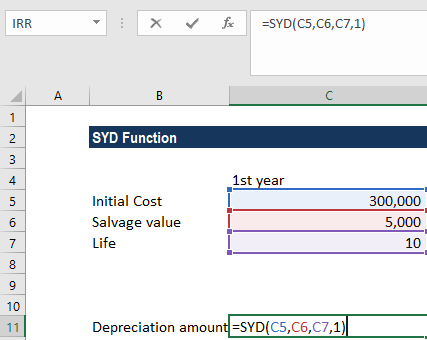 The SYD Function is a Financial functionFunctionsList of the most important Excel functions for financial analysts. This cheat sheet covers 100s of functions that are critical to know as an Excel analyst. SYD is short for sum of years digits. The function helps in calculating the depreciation of an asset, specifically the sum-of-years’ digits depreciation for a specified period in the lifetime of an asset. The SYD function is helpful to a financial analystFinancial Analyst Job DescriptionSee a real Financial Analyst Job Description including all the skills, experience, and education required to be the successful candidate for the job. Perform financial forecasting, reporting, and operational metrics tracking, analyze financial data, create financial models when building financial models or creating a fixed asset depreciation schedule for analysis. Salvage (required argument) – It is the value of the asset at the end of the depreciation. It can be zero. It is also known as the salvage value. Life (required argument) – It is the useful life of the asset or the number of periods for which the asset will be depreciated. Per (required argument) – It is the period for which we want to calculate the depreciation. 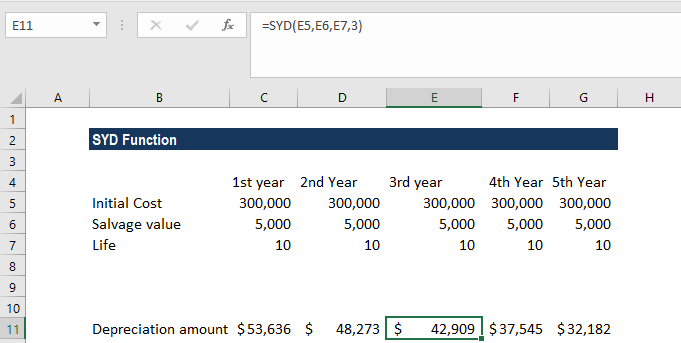 How to use the SYD Function in Excel? 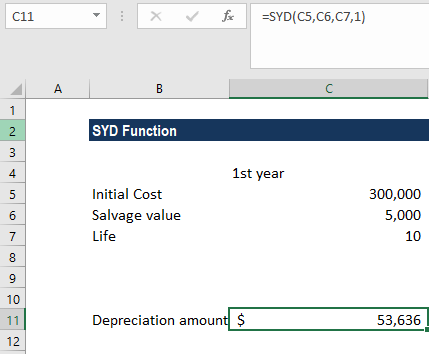 Suppose we want to calculate the depreciation for an asset with an initial cost of $300,000 and a salvage value of $5,000 after 10 years. For the subsequent years, we will change the per argument. So for the second year, the formula would be =SYD(D5,D6,D7,2). For the third year, the formula would be =SYD(E5,E6,E7,3). We need to provide the arguments life and per in the same units of time: days, months, or years. The salvage argument provided is less than zero. The life or per argument given is less than or equal to zero. The per argument provided is greater than the life argument provided in the formula.